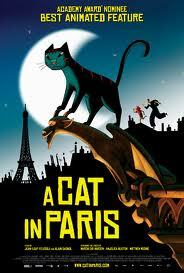 A Cat in Paris is a fun animated movie. By day the cat, is the loving pet of a hurt little girl, by night he assists a cat burglar. This was a bit more violent than I thought it would be; they actually fist fight at one point. Of course, the cat makes sure the hero wins. Not a movie for sensitive kids, or really young ones. But I thought it was very cute. I would watch it again. Do you know your prepositions? Julie Glover helps us all figure them out. I thought about doing an update of my general life and how things are going, because I know you all care 🙂 Not much to report- I have done yoga or gone to the gym every day this week. I’m more active on FB and Twitter again, and back to reading blogs. I have written some, but life has been crazy so unfortunately I didn’t get as much done as I was hoping too. How was your week> Any excited plans for the weekend? Movie looks great! And I know some family members who will particularly love it. Also, thanks so much for the shout out. I appreciate it. I agree with Ginger—looks like fun. 🙂 Thanks so much for the link up! Hope you’re having a brilliant weekend. It’s been pretty crazy but good. If you get a chance to see A Cat In Paris let me know if you enjoyed it 🙂 And your welcome, it’s a great post. That looks like a movie I’d probably enjoy. I saved it to my Netflix queue. Thanks for the shout-out! Let me know if you enjoyed it- I always get excited when someone watches a movie I blogged about 🙂 And I needed to pass on the great grammar help to other grammar challenged people such as myself.